It's dark and difficult to read - it seems the title of the song on the miniplayer begins with a special character ' " or so. There are several bug reports where song titles that begin with special characters cause synchronization problems. Have you tried the suggestion of temporarily removing the non-alphanumeric characters from the start of the song title? This error happens to me no matter what characters are in the song title. Basically the bar at the bottom always displays some random song. 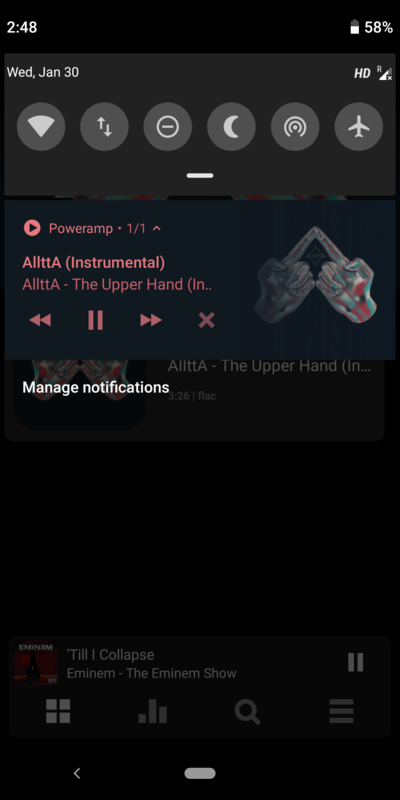 Even if I go back to the main menu, the bar at the bottom shows some random song as opposed to what is currently playing. Also curious, is there a way to remove this "now playing" / "last played" bar altogether as an option? What you are essentially suggesting to me is that there can be no songs in your entire Music folder with special characters in their titles, regardless of what song you are currently playing. Correct? Here is the problem. I could go through all my music and change the tags, but then the titles would not be accurate. And no other media player I use seems to have an issue with these special characters. 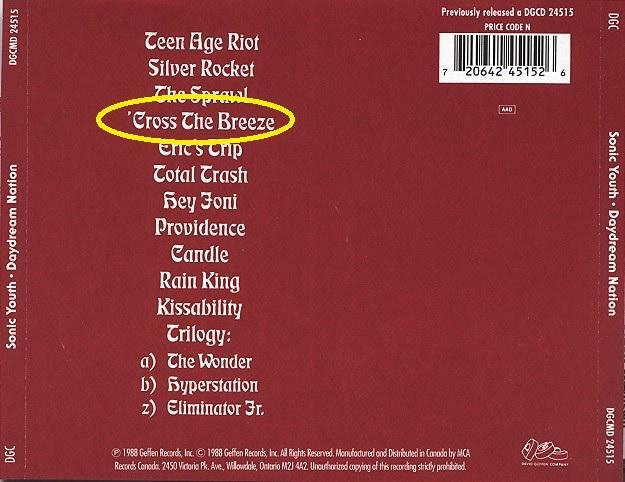 For example, 'Cross the Breeze is supposed to have that special character (see the attached image). I also have songs with titles like <ignore the quoatations> "(HOPE) Is Just Another Word With A Hole in it" and so forth.. so the point I am trying to make is something should be done to fix the issue because if you want to maintain an accurate music library, you want it to match the original source titles as much as possible... not make an acception because one media player has an issue with it. Yes, there might be a bug that prevents Poweramp from handling these files correctly. Agreed ! I don't want you to destroy your metadata ! 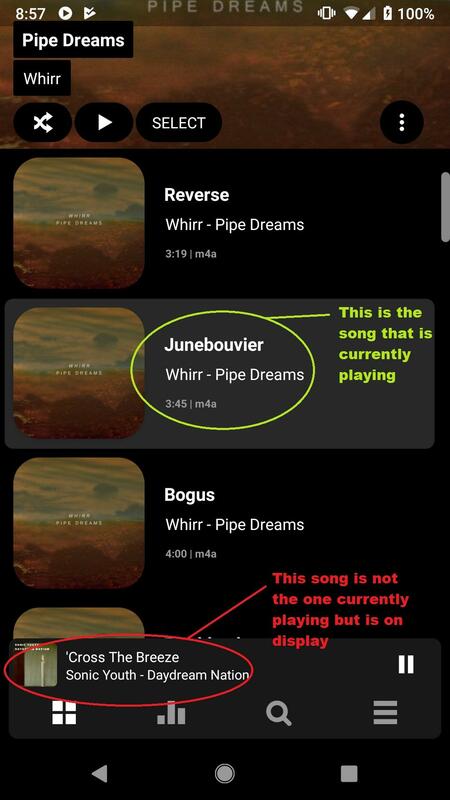 It might be helpful to verify my hypothesis about this bug if we could find somebody whose Poweramp installation shows this strange behaviour and who could and would change the tags for testing purposes. Preferably somebody with only a few strange songs 😀. Then it would be easier for the developer to analyse the issue. Having the same problem.it appear to be with all songs. You mentioned that 'NON-alphanumeric' characters so I make fill my library with ALL-alphanumeric songs without any NON-alphanumeric characters all over the list. But still the problem happens. I swear there is NO non-alphanumeric characters in whole song names, and even in whole album and artist names, only pure English characters exist. I can prove it if you want. Even there is no Arabic numerals / numbers (1, 2, 3 .... 0) on whole list. 'Blackout' is #2 song from all song list and what I play is #2 song from that album. When I move the track, the sequence follows. Still the same problem. So this is a bug regardless of the type of characters you should admit. Plus, it is quite absurd, unfair and illogical to suggest that non-alphanumeric characters should be removed altogether to fix the problem. That's not the way to fix. and we can't edit every single title w/o that and ofc I really don't want to spoil the original title which has its own meaning. So I beg you or anyone who is responsible to notice and fix this problem. Here is the example without a special character you want. This is not about fixing the problem, but finding its root cause. If you've got a better idea, go ahead. Thank You ! That was a good thing to do. What can you do ? Unfortunately I've no idea. What else I can do? Tell me another condition or option to try. Okay, another idea : if it's not the special characters as such that cause this behaviour, then perhaps it's a sorting that puts the specials characters at the beginning or the end, and the bug is that Poweramp takes the first / last song in the list rather than the correct one, and then it shows the ones witch the special characters, because they are at the beginning or end ? So everybody who is affected by this : could you play around with list options and sorting ? And see if this influences the behaviour ? Yet another thought : did you do a Settings > Library > "Full Rescan" after removing the special characters from the tags ? Might otherwise be worth a try, sometimes the normal scanner keeps some obsolete information in the library. I too experience this problem, where Now Playing shows the wrong song. This has been happening since I upgraded to V3. I've added and deleted numerous tracks since then, but the issue remains. 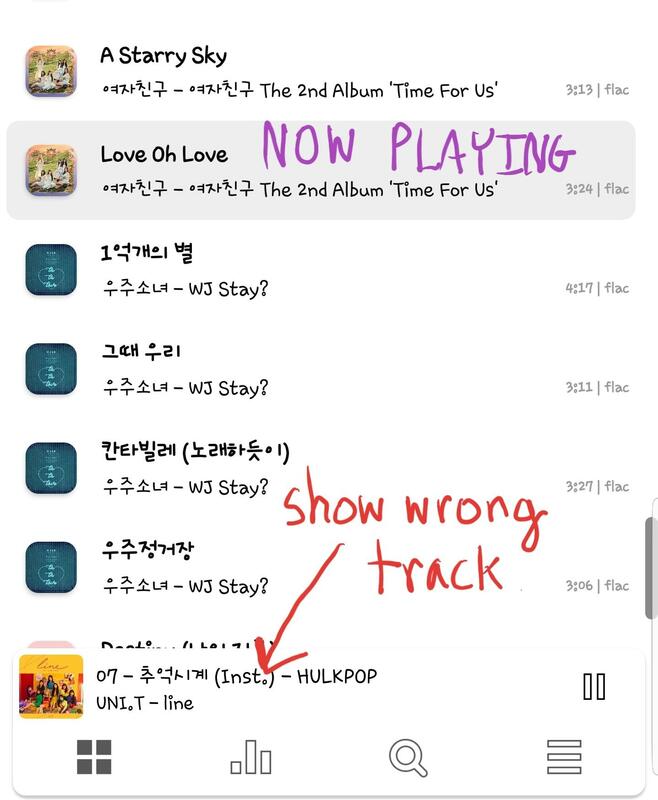 What seems to happen is that the "wrong" track displayed in Now Playing relates to the same ordinal track number in the "All Songs" list as viewed from the main screen. So, if I play Track 1 of an album, what Now Playing shows is the first track from the All Songs list. Track 2 of the album I'm listening to is displayed as the 2nd track in the All Songs list. Because the All Songs list is displayed and presumably stored in alphabetical order, the tracks displayed in Now Playing tend to be those that begin with non-alpha characters (if such are present on the phone), because they come first in the All Songs list, alphabetically speaking. On my phone, I have the Lemon Jelly album "'64' - '95", each track of which starts with "'" and a 2-digit number representing an abbreviated year. I see the track list of this album appear sequentially in Now Playing almost every time I start the app. Sometimes, if I minimise the app, or restart it, the problem goes away and the correct song is displayed in Now Playing. Hope this adds a little to the discussion! Yes, it does ! It seems to be clear by now that this has nothing to do with special characters, but a missing filter in the set of tracks that the miniplayer works on, or a pointer to the wrong set. It seems like the special characters bit might have been a red-herring after all, and it only happens with those files because they are the first items in the sorted All Songs list.